Yet He has given us so many everyday aids to make us aware of His unfailing presence. to be able to go walking admiring His handiwork. The numerous yellows and oranges remind of the sun. Those with deep brown centres. . . the earth. The deep blues ... the oceans. The light blues. . . the skies. The tiny blue and white flowers....the stars. The feathery white ones....the clouds. All remind me of our Creator God. The white daisies with yellow centres remind of eggs, food, and I think of God our provider. The white flowers .....the purity of His unconditional love. The many purples, particularly the wild orchids, make me think of his royalty and majesty. The greens of rosemary, thyme, mint, other herbs and their fragrances remind me of God our healer. These colours, with others, combine to form the colours of the rainbow. . .
reminding us of the faithfulness of His promises. Could go on and on, but the flower which tells me the most wonderful story is the poppy. the final sacrifice, the cruel price He paid, for my salvation. Our Saviour God. Also it tells another inspiring story. 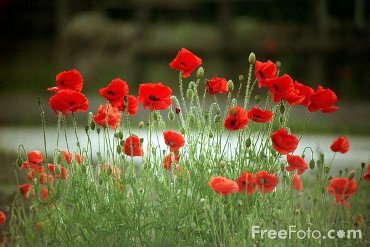 The seed of the poppy can lie dormant for years! 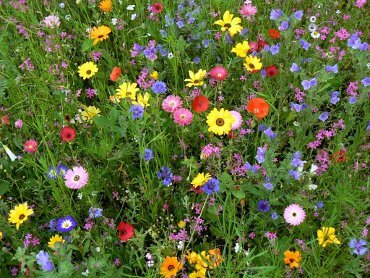 But when the ground is disturbed or freshly turned, the seed springs into life and come the appointed season bursts into bloom. around the numerous parcelas recently cut out of the hillsides. This reminds me of God's faithfulness to prayer. we may think that he hasn't heard our prayer as the years pass and nothing seems to happen. the seed resting in that precious soul so it bursts into life and blossoms into fruitfulness. Teaching me not only to be faithful and patient in prayer, but to trust Him too.